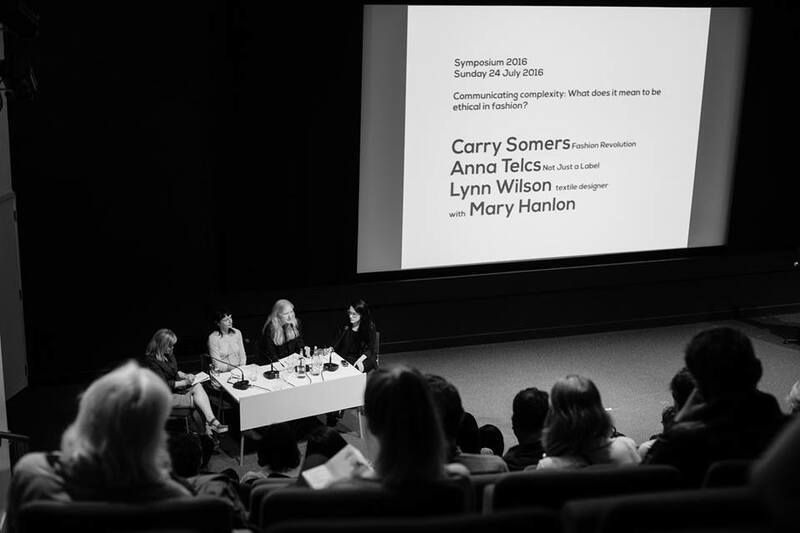 On 25th and 26th September, 2014, The London College of Fashion will host a symposium to explore contemporary South Asian cultures and fashion in relation to youth. The deadline on the call for participation is fast approaching: March 30th. This entry was posted in Conferences, Events, Responsibility and tagged consumption, fashion, South Asia, University of the Arts, Youth Culture on March 24, 2014 by Mary Hanlon. 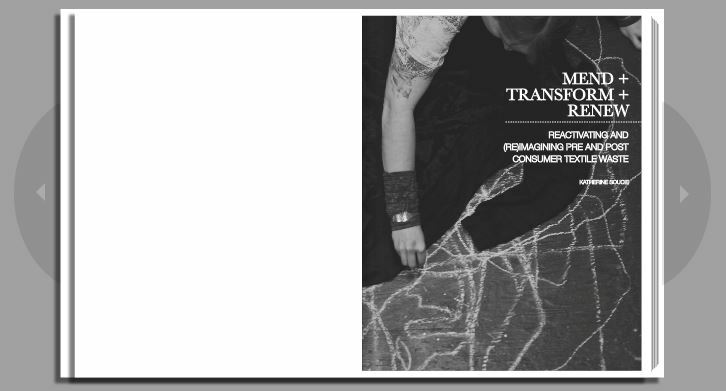 SA friend and colleague Katherine Soucie has recently published her research, Mend + Transform + Renew (re)imagination of Pre and Post Consumer Waste. This important body of work is broken-up into five strands: (S)ITUATE, (E)XPAND, (A)CTIVATE, (M)END, and (S)PINOFF. Students may be particularly interested in the Glossary. Check it out, and please share within/throughout your respective networks. The work is available online, but is also available in both soft and hard cover for school libraries or personal collections, etc. Katherine is a Visiting Lecturer in Textiles at the Welch School of Art at Georgia State University. This entry was posted in Responsibility and tagged consumption, fashion, Georgia State University, Katherine Soucie, Textile Art, Waste, Welsh School of Art, Zero Waste Design on September 28, 2013 by Mary Hanlon. Curb Your Consumption’s Katie Hart, recently asked my opinion on the three most important things consumers need to know, and the difference it would make to the fashion industry if consumers were more educated and conscious about the clothes they buy. What do you think are the 3 most important things consumers need to know? Consumers need to know and understand their role in, and association with, the social and environmental problems that occur in the lifecycle of a product. In this way, consumers need to take on part of the responsibility for the social and environmental impacts associated with the products they purchase. I don’t see anyway around this. Furthermore, it is crucial that consumers take on this responsibility in terms of their impact in the user end stage of the lifecycle (in laundering habits, for example). Having said that, it’s equally important for consumers to stay away from feelings of guilt over their purchasing and behavioural decisions, and instead move forward towards feelings of empowerment. How does a consumer gain control, however, when the “best” responsible product on the market only truly represents “the best of the worst”? In the context of choice, consumers might feel forced to choose between people or planet: People: [social (ex. human rights), cultural (ex. artistic traditions and language), political (ex. corruption), economical (ex. micro-finance), etc.] and Planet: [environment (genetic modification, chemicals, petroleum dependant materials, carbon footprint, environmental impact, biodegradability, etc. ), animals (cruelty free, vegan, etc.)] Consumers are beginning to feel like they can’t have it all—that when they make one good decision, like supporting a cruelty free product, in the context of animal rights, they have endorsed the use of a completely toxic chemical, that hurts both people and planet (take PVC, for example). Consumers need to know the truth, and the truth is that they can have both— it is possible. People are a part of this planet. They cannot be separated, and should not be separated at any stage in any products phase of life. ‘Cradle to Cradle’ design theory embraces this relationship, with respect for “all the children, of all species, for all time” (McDonough and Braungart, 14). Both consumers and designers need to understand that, when dealing with a corporation, profit will always come before people and planet, so long as the market designer allows. SA supports the theory that designers have to be good enough to create profit without compromising people or planet. Again, it is possible. Both consumers and designers need to not only understand the crucial role they play in determining the impact within the lifecycle of a product, but also understand that they don’t necessarily have access to the information needed to make properly informed decisions on the actual social and environmental consequences of that product. Both consumers and designers need to know that they have a choice. The choice for the consumer is to consume less and demand better. The choice for the designer is to learn more and do better. In doing so, they will each have taken on part of the responsibility for the social and environmental impacts associated with these products and taken responsibility for the social and environmental impacts associated with the products they purchase in terms of their impact on the user end of the lifecycle. What difference will it make to the fashion industry if consumers are more educated and conscious about the clothes they buy? Consumers play a crucial role in transforming the fashion industry; without them on board and engaged in the process of transformation, responsible products will ultimately fail. The consumer is the user, after all. If they are not happy, they will look for something else—something better. When consumers become more educated and conscious about the clothes they buy, they become empowered and seek out products with more confidence. SA believes that designers have a responsibility to be more educated and conscious, a responsibility to design something else—something better. Once educated on the issues, consumers can help facilitate change through their purchasing power as the end user. To learn more about Noir and what Ingwersen calls “social ethics” click here, and watch the short Documentary for Illuminati II: From the Heart of Africa. This entry was posted in Child Labour, Consumer Education, Cradle to Cradle, CSR, DESIGN, Education, Empowerment, Environment, fashion, Fibre/Material, Forced Labour, Freedom of Association, Gender Equality, Greenwashing, Harassment or Abuse, Health and Safety, HIV/AIDS, Hours of Work, Human Rights, Labelling, Labour, Landfill, Nondiscrimination, Overtime Compensation, PVC, recycle, Responsibility, Social Conditions, Social Responsibility, Socially Responsible Design, Supply Chain, Torture, Transparency, Wages and Benefits, Water and tagged consumer, consumption, cradle to cradle, Education, people, planet on January 14, 2010 by Mary Hanlon.